Welcome to the Lumen Christi home page! There are many peer-to-peer blogging awards, but I can’t say I know of any that are devoted to specifically to Catholic blogs. About.com Catholicism does have a Readers Choice and there are the Catholic New Media Awards, but neither has that same sort of in-the-trenches/personal/homespun recognition that comes from your blogging peers. Hence, the Lumen Christi award — a simple way of saying thanks to those who enlighten and remind us of the richness of our faith. 1) Name your favorite saint, and why. 2) Name your favorite part of the Mass, and why. 3) Name your favorite part about being a Catholic. The Ordinary Time green symbolizes hope and growth. One of the fonts used is called Dei gratia and can be found at http://www.dafont.com/deigratia.font. And one final note, this award is intended to be multi-ritual. Know a good Maronite or Coptic blog? Nominate ’em! We would like to list nominees as we learn about them and would encourage you to pay them a visit to see why they were nominated. Dec. 1 Update — Happy Liturgical New Year! Keep on passing the joy! Wonderful and thoughtful initiative, dear friend! We will happily pass this award forward. First, we want to thank you and would like to confer the award it back on to you. We will be posting the gratitude shortly on Biltrix. Thank you very much and God bless you! Gosh ,we are grateful, but don’t feel right about being a recipient. (that whole appearance of a conflict of interest thing, ya know.) Thank you for the thought! God bless and happy Sunday! As you wish. 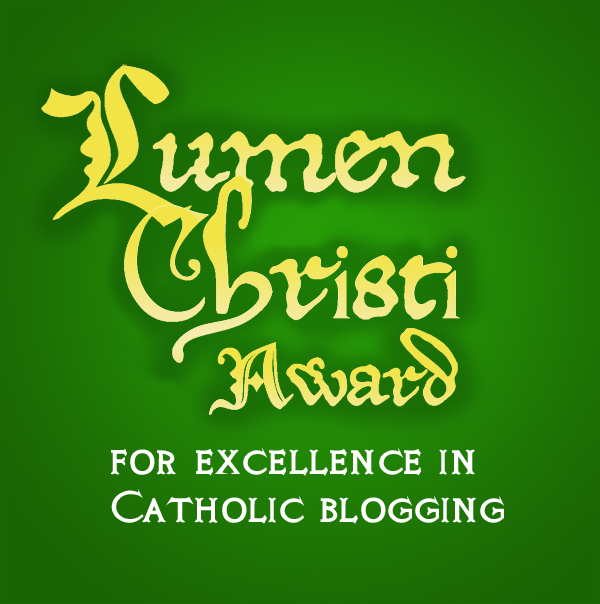 Thanks again for generating this award, which I hope will help spread the light though many Catholic blogs into the whole blogosphere. God bless! You’re very gracious! Besides, I’d be hard pressed to answer those questions! 🙂 Our pastor’s vigil Mass homily about how Catholics need to talk about their faith and the truth helped light the fire for this award. Oh, Congratulations! I’ve been following your blog for sometime now and I have been enjoying your gardening posts and photos. Now, I have one more reason to enjoy your blog and one more reason to feel glad to have ‘met’ you. 🙂 Anyway, I’ll try to check out some of your recommended blogs. You may wish to check out this blog http://www.patheos.com/blogs/publiccatholic/ It is written by a lawmaker from OK. Thanks so much! Blogging has been a great way to connect with others about the faith and see how others live and otherwise express their Catholicism. Please feel free to pass along other recommendations for sites as you did with Public Catholic. Thanks again for passing that on and nice to meet you too! Hello. I’m new to your blog but am tickled to find links to so many Catholic blogs! Glad you found us! Biltrix.com got us started in seeking out Catholic blogs. There are lots out there (of the Roman rite), not quite so many of some of the church’s sister rites though. Please feel free to recommend a link!